The Kenya Wildlife Service (KWS) has opened a forensic laboratory to boost the fight against poaching. The information gathered should help in prosecuting suspected poachers as cases can collapse because of weak evidence. The laboratory will build up a DNA database which will link stolen ivory and meat to specific animals. 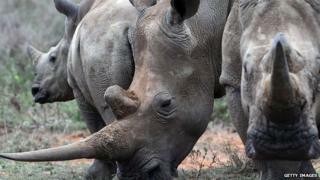 Poaching has damaged the wildlife population in Kenya with fears that some species could be pushed into extinction. The laboratory is the second of its kind in sub-Saharan Africa - the other being in South Africa - and KWS says it can be used by all countries in the east and central African region. A team of 45 researchers at the $1.7m (£1.2m) laboratory in the Kenyan capital, Nairobi, will now be taking samples from wild animals in order to extract the DNA. This information can then be used to provide "water-tight evidence" in court, according to KWS spokesman Paul Udoto. Mr Udoto says prosecutors have faced a problem proving that meat found with a suspected poacher is from a protected species. In the past suspects have been able to argue that it was goat or cattle meat. Now the evidence can be tested in court and compared with the information in the database to prove beyond doubt what animal it comes from. KWS says that bushmeat hunting is endangering some wild animals including the sable and hirola antelopes. DNA taken from smuggled ivory that has been discovered can be linked to an individual animal in a specific location. That information can secure a prosecution and help in intelligence gathering when trying to establish where poachers are operating, Mr Udoto says. About 100 rhinoceros have been poached in Kenya in the last three years and KWS things that if no "urgent interventions are made" rhinos could disappear from Kenya altogether. It is hoped that more prosecutions will act as a deterrent to potential smugglers. The illegal ivory trade has soared in recent years, and a kilogramme of ivory is now worth thousands of dollars. Much of the demand has been driven by a rapidly growing market in Asia.